Our theme this week is “Comebacks.” Yesterday we covered coming back from the Exxon Valdez oil spill; today we’ll switch gears and look at a few big comebacks in the business world! If you’re like most highly successful people, you’ll have to experience a certain amount of failure before your big win. If you’re a young person just starting out, you may feel the obstacles to success are insurmountable. If you’re a seasoned business professional trying to save a drowning company, you may feel you’ll never make it. Have no fear! You may be at your lowest, but you’re not alone. There are many examples of great business comebacks; here are a few to inspire you to make your comeback! An original comeback champ! Ford was tenacious in his automobile inventing. 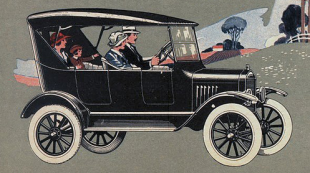 After numerous setbacks and failed business ventures (including his Detroit Automobile Co., which he started in 1899 and quickly abandoned due to low quality, overly expensive vehicles), Ford broke through in 1904 with the “Ford 999.” In 1908 he released the Model T, which garnered annual sales of over $250,000 by 1914. Jobs was fired from Apple in 1986 and spent the next 10 years developing a computer workstation (NeXT) that burned through investor money, but never saw many sales. When Apple bought NeXT in 1996, Jobs came back as interim CEO, eventually dropping the interim and leading the company for many successful years. Jobs brought Apple back from the brink of failure (thanks to a deal with Microsoft) and is now one of the most referenced business comeback stories. Legal trouble can be one of the hardest things to bounce back from. When Martha Stewart spent five months in prison for insider trading, she refused to accept failure (even as her stocks lost virtually all value and her “empire” crumbled) by keeping a high profile and getting right back to work after she was released. She’s managed to once again become a trusted source of information for everything domestic and her magazine is still going strong (yes, I do subscribe—it’s a good thing). When she started The Body Shop in 1976, Roddick was met with strong resistance from local funeral parlours, who objected to the name (for those who aren’t familiar, The Body Shop is a skincare and makeup company and has nothing to do with the funereal arts). She fought back by publicizing the debate to a local paper, claiming she was a female entrepreneur under attack. The publicity drove traffic to her business, and by the early 1990s, there were over 700 Body Shop stores. “Colonel Sanders,” who had first failed at a number of careers, had been cooking chicken in his restaurant/hotel for over 20 years when a newly built interstate bypassed his town, taking away all of his business. Sanders was broke. He began traveling and franchising his fried chicken business and within five years had 400 Kentucky Fried Chicken locations. After working for over 25 years for Stanley Home Products, Ash was fed up with being passed over for promotions and losing out to less qualified male colleagues. She resigned and began writing a business advice book for women. This became her business plan for Mary Kay Cosmetics, which has grown to a multibillion dollar business today (seen the pink Cadillacs?). Remember, if you’re going through a tough patch in your professional life, you’re not the first. Many before you have tried, failed, and then found success. Good luck!